In 1883, Bedford Brown read a paper before the Virginia State Medical Society, which was published two years later as Reminiscences of Personal Experience in the History of Diphtheria. It opened with a heart-breaking account of a consultation he was called to in 1856. The 10 year old patient, “an exceedingly bright, and interesting boy” lived “in a large airy residence, surrounded with grounds perfectly cleanly and well kept.” But the child was terribly ill, with an “enormously enlarged tonsil” covered in a “thick, tenacious, pearly white coating as if painted with a brush” and he “was suffering extreme distress from difficulty of breathing and deglutition.” After an agonizing few hours where the doctors could do little beyond watching his decline, the boy died. Diphtheria is a bacterial infection that can be transmitted from one person to another through respiratory droplets. It is particularly dangerous for children. In 1826, to describe the greyish coating that marked a sufferer’s throat, physician Pierre Bretonneau gave the disease its name, diphtérite, based on the Greek word for leather or hide. This coating, or membrane, covers the throat and tonsils, and is often accompanied by a fever, sore throat, nasal discharge and increasing difficulty in breathing that can be agonizing. If nerve damage is severe enough, the muscles controlling breathing can become paralyzed. The disease can also damage the heart muscle and can lead to congestive heart failure. Before mass vaccinations reduced the rates, as late as 1921, the United States recorded 206,000 cases; of those, 15,520 led to death. The major breakthrough in controlling diphtheria came about in the late nineteenth century. This revolutionary era was ushered in by scientists like Robert Koch and his team in Berlin, who established germ theory and discovered the microbiological causes of anthrax and tuberculosis. Other milestones included French scientist Louis Pasteur’s introduction of vaccines for rabies and anthrax, and Paul Ehrlich’s work on “magic bullets” that led to an effective treatment for syphilis and set the stage for what became modern chemotherapy. In 1890, Emil von Behring and Shibasaburo Kitasato announced the discovery of a serum that defended mice against diphtheria. Their research, which also built on the work of Emile Roux and others at the Pasteur Institute, led to an antitoxin that was suitable for human use, and it was introduced into North America in 1894. What did these new diphtheria discoveries mean for young children in Canada? In the late nineteenth century, “diphtheria emerged as the most prevalent of the infectious diseases in the province of Quebec.” But although progress was uneven and slow, mortality rates began to slowly drop, and when mass immunization was introduced there was a dramatic decline in new cases. In Ontario, as historian Jane Lewis notes, the first diphtheria antitoxin was developed at the University of Toronto in 1914 by J.G. FitzGerald, and the Provincial Government began in 1915 to provide the antitoxin for free. By the 1920s, the medical community, marshaled radio programs, churches, the press, advertising companies and school boards to launch a campaign to stop the disease. And although they faced resistance, the provincial government undertook a program of mass immunization of school children. The result of all these efforts is striking. In 1920, deaths from diphtheria were 25.7 per 100,000; in 1939, the rate was 0.9 per 100,000. Today, the impact of the vaccine is felt globally. According to the WHO, in 2013 about 84% of the world’s population received immunizations against diphtheria, tetanus and pertussis, amounting to about 112 million infants. The WHO estimates that immunization saves between two and three million lives every year. But diphtheria still exists, and the gains we have made against it can be lost. Maintaining high rates of vaccination is crucial, but in poorer countries, a lack of access is a significant barrier. According to a recent WHO report, in some parts of sub-Saharan Africa the rate of childhood immunization against the disease “reaches less than 50% of the birth cohort.” In these regions, “mortality and morbidity from diphtheria are still unacceptably high.” In wealthier countries, where the vaccine is readily available, some parents are rejecting the call to immunize their children for fear of the risk of side effects or for personal and religious reasons. 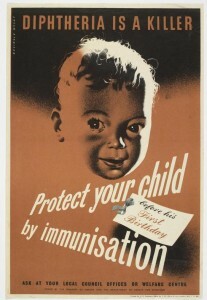 Catherine Carstairs has argued that “we need to work harder at convincing Canadians of the merits of vaccination.” An important place to start is to underline how, because of immunization programs, our children are now protected against horrific and deadly diseases that have devastated previous generations. Although medical research and medical interventions do not always prove to be successful or beneficial, the case of diphtheria is a shining example of how scientific knowledge, applied to fighting disease, can save lives. We should celebrate the fact that diphtheria has dramatically declined as a killer of children since the beginning of the twentieth century. The hard work and hundreds of small steps in laboratories, clinics and research centers, as well as the dedication of thousands of doctors, nurses, community workers, parents and child care workers, has saved many lives and demonstrated how far the benefits of vaccinations outweigh the risks. Deborah Neill is an associate professor of history at York University. She is the author of Networks in Tropical Medicine: Internationalism, Colonialism, and the Rise of a Medical Specialty, 1890-1930 (Stanford University Press, 2012). Bedford Brown, Reminiscences of Personal Experience in the History of Diphtheria. St Louis: J.W. Lambert, 1885, pp. 3-4; 5. College of Physicians of Philadelphia, “The History of Vaccines.” Accessed on May 22, 2015, http://www.historyofvaccines.org/content/timelines/diphtheria. For a complete list of symptoms and complications see the Mayo Clinic website, “Diphtheria,” Accessed on May 22, 2015, http://www.mayoclinic.org/diseases-conditions/diphtheria/basics/symptoms/con-20022303. College of Physicians of Philadelphia website, “The History of Vaccines. Accessed on May 22, 2015, http://www.historyofvaccines.org/content/timelines/diphtheria. Catherine Braithwaite, Peter Keating and Sandi Viger, “The Problem of Diphtheria in the Province of Quebec: 1894-1909,” Histoire Sociale/Social History 29, no. 57 (1996): 74. Jane Lewis, “The Prevention of Diphtheria in Canada and Britain 1914-1945,” Journal of Social History 20, no. 1 (1986): 164, 165-166, 163. For an account of campaigns against diphtheria in the U.S., see Evelynn Maxine Hammonds, Childhood’s Deadly Scourge: the Campaign to Control Diphtheria in New York City, 1880-1930. Baltimore: Johns Hopkins University Press, 1999.